No matter what you’ve tried, stress is not going to let up any time soon. In order to manage stress and thus manage your health, you need to try a few different stress management tools. For some, things like meditation might work well but for others, they might want to do something a bit more active. Yoga is one of the most recommended tools in stress management, allowing your mind to focus on something besides your stress while releasing tension and slowing your heart rate. Here’s what Yoga can do for you. Tension is a natural response of your body when it is under stress. When your body feels threatened by stress, it will begin to tense up in order to ready itself to run away or to fight. But since you’re not actually in a fighting situation, this tension doesn’t have anywhere to go. 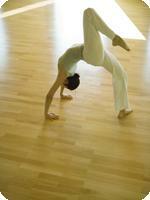 With Yoga, you will be able to stretch out your muscles and begin to release your tension. In doing so, you will be able to make sure that you are calm and loose, which allows you to feel less stressed. Even if your mind is still filled with worries, having less muscle tension allows you to feel more in control. Studies are showing that stress and pain are interconnected. While it’s not completely clear how this works, those who are more prone to stress tend to have more pain in their lives. When you do Yoga on a regular basis, you will begin to release stress from your mind and you will be able to release pain from your life. Since pain can cause stress, and stress can cause pain, taking stress out of the equation seems to be the most helpful way to help your body and your mind. When you’re practicing Yoga, you will find that you are unable to focus on anything else but on the movements. This allows your brain to begin to quiet down and to release its worries. While the worries and the problems might still be present, taking some time to push them aside will make you feel less stressed. Over time, you will find it’s easier and easier to push your worries aside, allowing you to focus more on the present time and how you can begin to change your actions and your attitude today. By adding Yoga to your stress management plan, you will begin to see the results immediately. It has a strong relaxation effect along with Stress Sweeper. You will feel less stress and you will begin to feel more in control of the problems in your life. While life may never be stress free, it can feel that way.